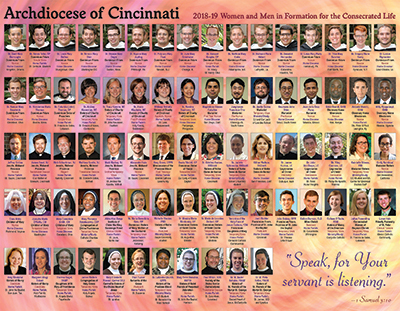 Again this year, the Sisters of the Precious Blood communications office has teamed up with the Archdiocese of Cincinnati Office of Consecrated Life and Office of Vocations, as well as other religious communities, to create a poster featuring men and women in formation for consecrated life. The poster is distributed to Catholic high schools, university campus ministry programs, every parish in the archdiocese, and the major superior of each community represented on the poster. It is also on display in archdiocesan offices. The poster was first produced in 2014 and at that time featured 13 men and women from eight religious communities. The 2018-19 poster features photos of 75 men and women representing about 30 religious communities. Each person is either from a parish in the Archdiocese of Cincinnati or is in the archdiocese for formation or work here. Also included on the poster is each person’s name, religious community, stage in formation and home parish or diocese.